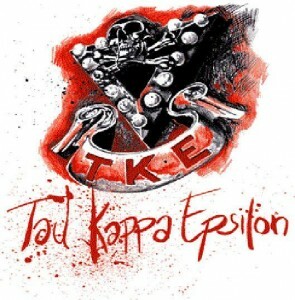 TKE at Buffalo State College was granted Colony Status on May 18, 1978. This status was given after a semester of gathering interest to form a group that wanted to go forward with the idea of starting a new Fraternity at Buffalo State College. It all started when Tom Muscarella, attended some TKE events at the University of Buffalo where some of Tom’s friends were members. They encouraged him to start a group at Buffalo State College. After Tom spoke with some people he knew from his department at Buff State, the initial group asked for some help from Buckwheat Perry. Buckwheat guided them through the process and helped them along the way. After Colony status was granted, the hard work of membership recruitment started and the long process of a petition to become a full fledged chapter. There were many ups and downs as many members came and went. Along the way the group gained some stalwart members that stuck it out and worked hard to make it all work. Tom Mayer, Tony Bonn, Tim McFarland, Tim Hastings, Mike Brady, and Ted Johnson just to name a few that stuck it out and helped bring Pi Mu to fruition. 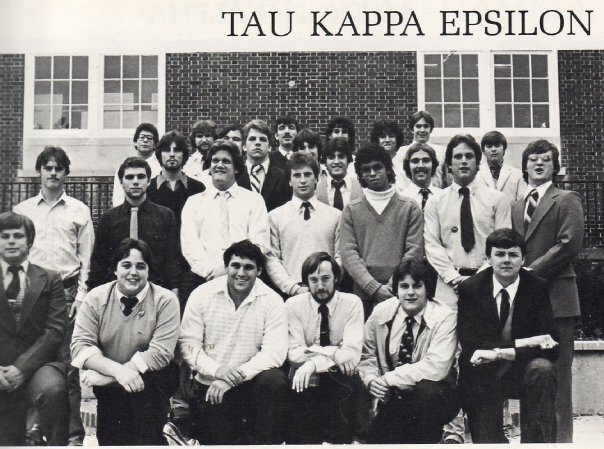 The Fall of 1981 was a banner semester because of the Epsilon Pledge Class. This pledge class finally gave us the numbers that were required to meet the standard for the petition. 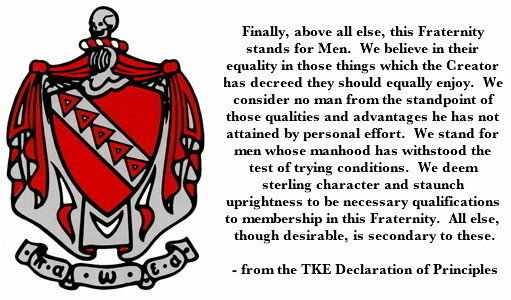 In the Spring of 1982, with much help from Tim Moran, we were able to submit the petition and were granted a Charter for Pi Mu Chapter of Tau Kappa Epsilon. 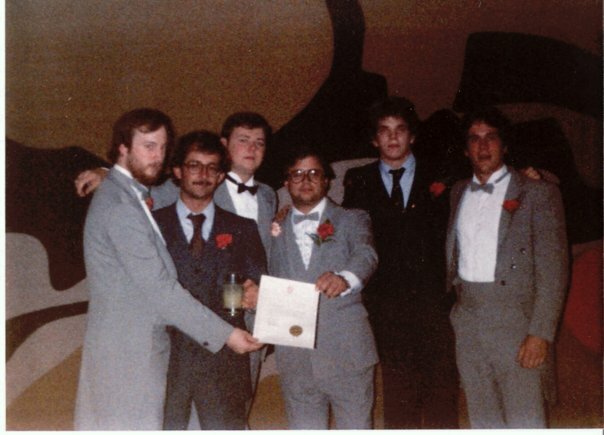 The induction on April 24, 1982 of 37 men into the bond of Tau Kappa Epsilon was overseen by Silver Maple Leaf Award winner Ed Dominey, future Grand Prytanis Tom Castner and the Grand Hegemon Jim Margolin who became a future Grand Prytanis. The Induction dinner was held on the 38th Floor of the HSBC building, many thanks to Bob Macintosh for setting this up. 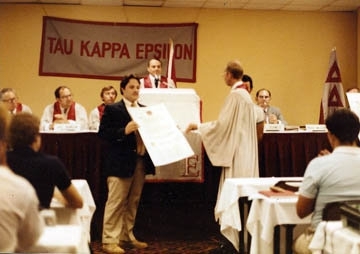 In the summer of 1982, Tim Moran traveled to TKE Heaquarters in Indianapolis to officially accept the Charter on behalf of the Fraters of Pi Mu Chapter. The next year Pi Mu had a “Chartering Hangover”, many Chapters experience this after the excitement of establishing a new Chapter. The Chapter recruited 6 new members along with gaining a few guys who were from other schools and a couple Fraters who were original founders but had moved away before chartering. Pi Mu rebounded in the mid 80’s and regained momentum with strong pledge classes and continued success. Like all Fraternites you sort of have ups and down with the recruitment cycle. To see all the pledge classes through the years click here. Our scroll reflects the many great men who have been initiated into our chapter since. A few of these men also went on to lead our chapter in the role of Prytanis. These past Prytaneis are listed here. As you can see from the links above… as the eighties closed and we entered the nineties and then the new century, Pi Mu has had much success in recruitment and strong leadership. We have carried on with the homecoming traditions and our strong urge to help the community. Countless hours have been spent at soup kitchens, community cleanups, and Red Cross Blood drives. The one earth sifting event that we still struggle with to this day, is the explosive cost of Liability insurance that straps a yoke around the finances of the fraternity. Please read more about this dilemma here. With your strong alumni support we will be able to continue to operate the chapter with success well into the new century. Without Alumni support from all, the chapter will continue to be cash strapped as we have been for the last decade. Operating in this manner doesn’t bode well for the long term viability of the chapter. Going forward, Pi Mu needs everyone’s support to guarantee that Pi Mu will exist for future generations of young Fraters trying to be good citizens and to help us grow as a group. Thank you for your continued support of Pi Mu. 1982 Founders photo: Row 1: David Klaus, Tim Moran, Russ Indelicato, Ted Johnson, Mark Mogilski, Mike Brady. Row 2: *Steve Trask, Paul Valerio, Rob Quinn, Carmen Todoro, Dave Lugo, Tim McFarland, Robert McIntosh. Row 3: Jim Nease, Tim Hastings, Scott Brown, *Charles Ventura, Tom Redmore, Dan Wilber. Row 4: Jerome Muscarella, Mike Sonntag, Bill Roge, Rich Ebeling, Tony Tambasco, John Furer, Tom Rys. Not Photographed: Dave Keiper, John Hoffman. There are also Founders missing because this was a 1982 yearbook photo and they were alumni by then. These include Tommy Muscarella, Karl Grampp, Tony Bonn & Tom Mayer. * Indicates members of the Epsilon pledge class that were never initiated. Awesome site. Hope all is well with the Chapter. Hard to imagine it has been so long. One of these days I will get back to Buffalo and drinks are on me.